What are treatment options for a urethral stricture? What is the best treatment for a urethral stricture? For patients who have light, filmy, short strictures without a lot of scar tissue in the urethral sponge (called spongiofibrosis) active surveillance, urethral dilation or a endoscopic incision of the urethra may be an option. For patients who have had a recurrent stricture or a dense or long stricture and who are in good health, a urethral reconstruction, also called a urethroplasty, is usually the best option, but only in the hands of a highly skilled surgeon. A urethroplasty is an operation done in the hospital under anesthesia to reconstruct the urethra. It fixes the underlying problem of urethral strictures, the spongiofibrosis and, in most patients, permanently cures the stricture. It usually does this in one of two ways. Either by (1) excising, or removing a section of the urethra that contains the spongiofibrosis and the stricture, (called an end-to-end urethroplasty); or (2) by bringing new tissue, such as a graft from the mouth, called a buccal mucosal graft, or a flap of skin to help reshape urethra. Typically, for long complex strictures a flap or graft is necessary; and for shortstrictures excision of the diseased segment is enough. The surgery itself is complex and delicate, and requires a urologic surgeon with extensive experience in this for best outcomes. Patients typically stay in the hospital for 1 to 2 days and have a urinary catheter in for 2-3 weeks after the surgery. Post-operatively patients often experience dramatic and long-lasting improvement in their urinary symptoms. 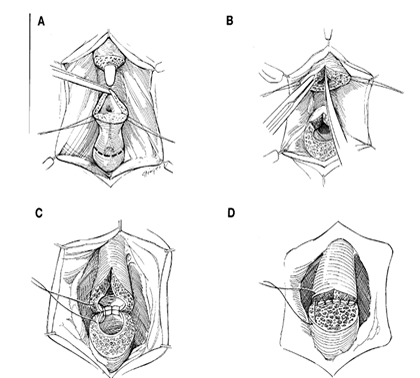 This drawing shows a typical “end-to-end” urethroplasty where the stricture and spongiofibrosis is cut out and the urethra is put back together. Why should you have a urethroplasty? Because data has definitively shown that it provides the best long-term cure rates for patients withurethral strictures. In expert hands it is clearly the best option if you want your problem fixed permanently. It can be safely done and recovery tends to be relatively quick with minimal pain in the large majority of patients. What if I have a stricture from radiation? Radiation induced urethral strictures can be a very difficult problem to treat because of the potentially devastating effects of the radiation on your tissue around the urethra. Sometimes the strictures are accompanied by a fistula which is even more difficult to treat. There is no consensus among reconstructive urologists on how best to treat this issue. We have had good success using a combination of a buccal graft (from the mouth) and a muscle from the inner thigh, called a gracilis muscle flap, to correct this problem while preserving erectile function and urinary continence and minimum consequences to functionality. Why do urethral strictures come back? If you took a cross-section of the urethra it would look like a donut. The “crumbly” filling of the donut is the urethral sponge and the inner hole of the donut is where urine is carried and where is where thestricture occurs. In the case of a urethral stricture the urethral sponge gets scarred in a process called spongiofibrosis. If a stricture recurs after treatment, it is usually because underlying spongiofibrosis or scar tissue prevents the stricture from healing properly by preventing healthy nutrients from reaching the lining of the urethra. Why do other doctors recommend a urethral dilation or a endoscopic urethral incision (urethrotomy)? Most urologists are not comfortable, experienced, or trained to do complex urethral reconstructive surgery and fall back on the easier, quicker option of dilation or incising the stricture. In addition, many urologists are simply not aware of the excellent results from urethroplasty. What to do: urethral dilations or urethrotomy first? After one failed dilation or incision, there is nearly a 100% recurrence rate — that means that almost all dilations after a stricture recurrence fail to last. Furthermore each dilation or incision will worsen the extent of spongiofibrosis which makes the strictures, when they do recur, denser and longer and decreases the cure rate of definitive surgery. The following graph demonstrates the likelihood of success from a urethral dilation. The solid line represents patients who have on dilation for which there is an approximately 60% success rate. However the two dotted lines represent patients who have had a second and third dilation. The long-term success rate is 0%. This and other data suggests that eventually most dilations fail for recurrent strictures. 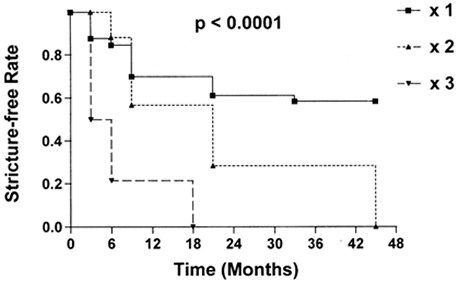 What is the success rate of the UroLume for urethral strictures? UroLume was popular about a decade ago and has fallen out of favor among many urologists who are knowledgeable about stricture disease. We do not think this is a good option in the large majority of patients. Only in patients who are too sick to undergo a definitive procedure and have a short life expectancy, is UroLume a good option. In large part this is because the failure rate is very high and when failure does occur a urethral recurrence can be difficult to treat and the UroLume is difficult to remove. A subsequent urethral reconstructive surgery to definitively fix the problem becomes more difficult if you have a UroLume in place. If your doctor advises you to get a UroLume, get a second opinion!